Posted on Wed, Feb 22, 2012 : 9:48 a.m. Sales of a new cereal bearing the name of Detroit Tigers pitcher Justin Verlander will benefit Ann Arbor's Veteran Affairs hospital, officials announced today. A cereal named after Justin Verlander will be sold at Meijer. The cereal, called Fastball Flakes and introduced by PLB Sports, will be sold only at Meijer grocery stores in the metro Detroit, Lansing, Kalamazoo and Grand Rapids areas. It will also benefit the John Dingell VA Medical Center in Detroit. 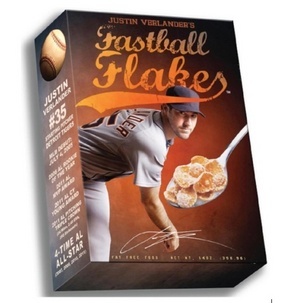 The 2011 American League Cy Young Award winner, who founded Verlander's Victory for Veterans Foundation, agreed to donate 100 percent of his proceeds from the sales of the frosted corn flake cereal. The VA Ann Arbor Healthcare System serves more than 150,000 veterans living in a 15-county area in Michigan and northwest Ohio. The hospital, which has 101 acute care beds and 46 nursing home beds, and a community living center treated nearly 6,000 patients for inpatient stays and recorded about 455,000 outpatient visits in the 2010-11 fiscal year. Some poor soul was trying today to buy this Verlander box at the Carpenter Meijer's. I overheard the clerk say they don't have it yet. Wed, Feb 22, 2012 : 8:09 p.m. I think Verlander Krispies is a better name. SNAP of the wrist, CRACKLE of the ball as it is heading to home plate and POP of the catcher's mitt shortly after it comes across the strike zone. Wed, Feb 22, 2012 : 3:06 p.m.